Jekyll Island Historic District | Guide to Jekyll Island Club Hotel, Crane Cottage, Horse Stables and History Museum, Jekyll Island Museum, Jekyll Island History and more. Explore Living History on Jekyll Island, Once a Millionaire's Retreat During America's Industrial Age. 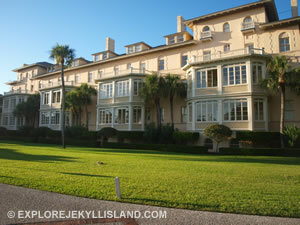 Jekyll Island was once an exclusive winter retreat for some of America's wealthiest families. Their exclusive Jekyll Island Club, a collection of "cottages" and a variety of support structures are now a National Historic Landmark, the Historic District is open to the public. 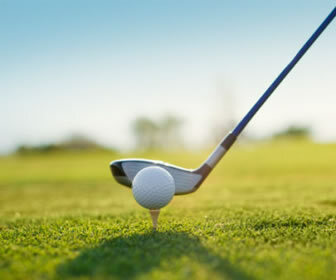 Today, owned by the State of Georgia, the island retains much of its natural beauty and offers a wealth of amenities and activities including 63 holes of golf, tennis, beaches, 20 miles of bike paths, mini-golf, nature tours and Summer Waves Waterpark. Jekyll Island is rich in history and legend. Native Americans, Spanish missionaries, English settlers, French planters, millionaires, modern residents and tourists have all played a part in the evolution of Jekyll Island. 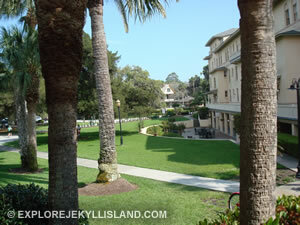 Jekyll Island is now a family resort with ten miles of public beaches. 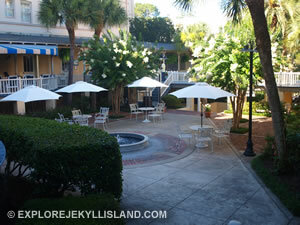 The Jekyll Inn is the largest oceanfront resort on the Island, with 15 acres of oceanfront property. After a period of private plantation ownership ending with the DuBignon family, the Island was sold to a group of very wealthy individuals who formed the Jekyll Island Club, including such family names as Rockefeller, Pulitzer, Vanderbilt, Crane, Goodyear, Macy, J.P. Morgan and others. 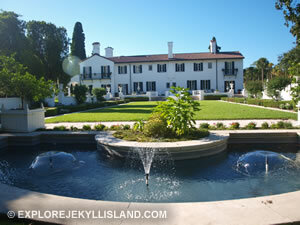 One-sixth of the world's wealth vacationed on Jekyll Island at that time. 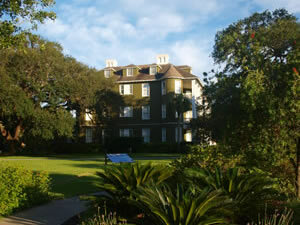 The conferences leading to the development of the Federal Reserve Bank were held at the Jekyll Island Club. 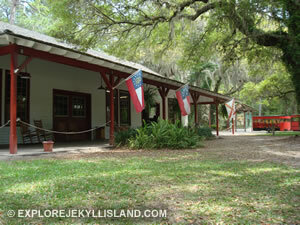 Jekyll Island was also a participant in the first transcontinental telephone call on January 25, 1915. In 1946, Jekyll Island was purchased by the State of Georgia and is currently maintained as a state park. 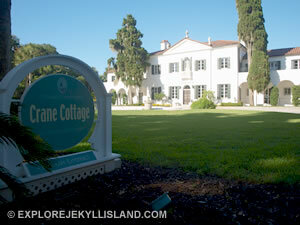 The Crane Cottage was built for Richard T. Crane, Jr., whose father founded the toilet company. It was in this cottage that the Federal Reserve System was crafted by John. D. Rockefeller, J.P. Morgan, and other members of the Jekyll Island Club. 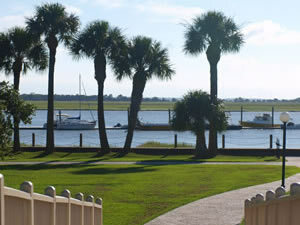 The grounds and landscape throughout the Jekyll Island Historic District have been lovingly maintained to capture the essence of how the priviledged lived during Jekyll's halycon days. Jekyll Island is renowned for its landmark Historic District, termed the "Millionaire's Village" long ago, with its 240-acre site containing 33 historic structures, including the Jekyll Island Club Hotel and surrounding cottages that were once home to some of America's most wealthy and prominent citizens. Wealthy and notable Jekyll residents included the Crane family, the Pulitzers, Morgans, Vanderbilts, Rockefellers, and Goodyear clan to name but a few. These privileged few used Jekyll Island as a hunting and golf retreat, escaping cold winters here and building these historic homes that have been lovingly restored to their former glory. Side view of the historic Jekyll Island Club Hotel showcases the restored architecture and pristine grounds that have earned this place a spot on the Historic Hotels of America. 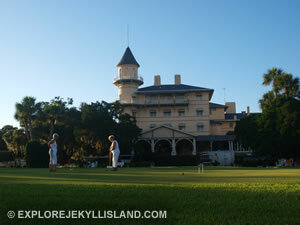 The grounds of the Jekyll Island Club Hotel offer a fabulous spot to enjoy a leisurely game of croquet. It was in this building that telephone inventor Alexander Graham Bell made the first transcontinental phone call between Jekyll Island, Washington D.C., New York City, and San Francisco. The inner courtyard of the Jekyll Island Club Hotel features plenty of shade and a variety of tables for eating or resting for a spell. Lovely fountains and manicured landscaping offer visitors a trip back in time to a more relaxed way of life. 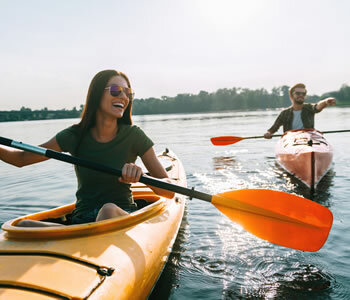 Stepping away from the Hotel you'll find the Jekyll Harbor Marina, offering overnight docking, fuel and snacks. This was once the spot where America's wealthy millionaire industrial barons arrived to spend their summers at the Jekyll Island Club. These restored horse stables in the Historic District houses the Jekyll Island History Museum featuring many artifacts and period pieces of interest, as well as carriage and horse stables from the 1900s. 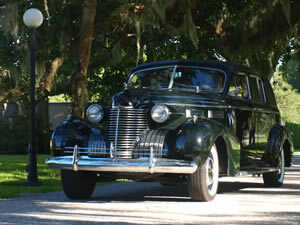 You never know what you'll find while strolling the grounds in the Jekyll Island Historic District. On this hot summer day, we stumbled upon a classic automobile driving through the narrow pathways that traverse the 240-acre site.